President Mahinda Rajapaksa is known to me for well over four decades. I first met him through my cousin Nihal Amarasekera who was a classmate of Basil Rajapaksa at Ananda College. I met Mahinda for the first time during the 1960s. During the latter part of 1960. I became a member of the SLFP. The same year after the demise of D. A. Rajapakse who was the co-founder of the SLFP, Mahinda was appointed organizer for Beliatta in 1969. In the 1970 elections he won the Beliatta seat by a huge majority and became the youngest Member of Parliament. He took oaths as an MP on June 7, 1970. Having the privilege of being the youngest MP he was invited to propose the vote of thanks for the Throne Speech which was seconded by another young MP Edwin Wickremaratne. Mahinda Rajapaksa’s family is deeply interwoven with the people that at a very young age they become successful politicians. In 1947, the youngest Member of Parliament was Lakshman Rajapaksa, the paternal uncle of Mahinda Rajapaksa. In 1970, the youngest MP was Mahinda Rajapaksa. In 2010, the youngest MP is Namal Rajapaksa. This reveals that the Rajapaksas have the support of the people from their childhood and politics is running through their veins. The touch of human kindness, the understanding and tolerance of the people are well understood by the Rajapaksa family. It is common knowledge that the Rajapaksa ancestral home is a haven for the people. No one who steps in to that house leaves without having a meal. Their hearts and minds are filled with joy so are their stomachs. The milk of human kindness and compassion for fellow human beings are the grundnorm of the success of Mahinda Rajapaksa. Mahinda is the only SLFP leader who represented Beliatta as an organiser from 1970 to 2010 without resigning from the SLFP. Even the Bandaranaikes have not been continuously loyal to the party. After the death of S. W. R. D. Bandaranaike, Mrs. Sirimavo filed papers as an independent candidate from Attanagalla. Chandrika was a member of Vijaya Kumaratunga’s party. Anura has often been in and out of the UNP. Mahinda entered the legal profession in the mid 1970s as a lawyer and became a successful defender of the rights of man. He underwent training in Prague on Labour Law. He was the founder of the Palestine Solidarity Movement in Sri Lanka. It is noteworthy to mention that there is a road named after Mahinda Rajapaksa in Palestine. Mahinda’s political career underwent turbulent climate. The tidal waves of jealousy, enmity and vile allegations created many stumbles, but Mahinda survived the trying situations, overcame the obstacles and became a stronger leader by his experience. There were several false charges levelled against him and he was in remand during the demise of his mother. He was acquitted and cleared of all false allegations. The youngest MP in the 1970s is today the President by a huge majority. Mahinda Chinthana’s popularity has triggered the pulse of the people - the people’s president is now the heart throb of the people. The characteristics of Mahinda could be aptly summarized as that Mahinda stood firm for the unitary State, one people, one Sri Lanka and one race - the human race. He practised law until he became a Minister in 1994. In his legal career he has appeared pro duo (free of charge) to the less fortunate. During the past 40 years. I met him often since I served from time to time in the Exco of the SLFP and the Samastha Lanka Karaka Sabha and as Deputy President of the SLFP Lawyers’ Guild. A life member of the Bar Association Mahinda always voted at the annual election of office-bearers. I still remember in 1996 when I contested the Presidency of the Bar Association he got his vote transferred from Tangalle Courts to Colombo courts in order to cast his vote. He comes in a sense from a family of lawyers at present in view of his son Namal, a British law graduate who is now doing his finals in Sri Lanka. Moreover his sister-in-law Pushpa Rajapaksa is a very senior Attorney-at-law of Sri Lanka and his uncle George Rajapaksa was an advocate of the Supreme Court as well as his son the late Shyamal Rajapaksa too was an attorney-at-law. Mahinda was the first respondent in the landmark case Rajapaksa Vs Gunasekera (Kalawana Election petition - 1983) whose the Supreme Court upheld his argument inter alia that the vote of Kalawana to whom the alleged defamatory statement was directed are a segment of original society which holds conservative views on morality and which is not disposed to tolerate permissiveness in any measure. 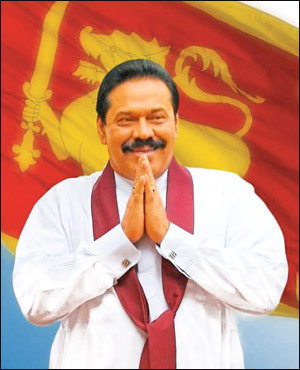 President Mahinda Rajapaksa is the Saviour of the Nation. His success can be attributed to the closely knit family of patriots to whom he is deeply indebted. Mahinda Rajapaksa’s achievements have made him a World Leader a Leader with the aspirations of the people as paramount importance.